Welcome to all our current and prospective Apprentices in joining one of the fastest growing and progressive trade Unions in Australia. Currently we have over 1,300 apprentices enjoying the benefits gained by being a Member of their Union. We have a proud history and a strong future. Our record of protecting workers rights and entitlements since 1850 is second to none. We have been Federally registered since 1912. An important part of this Trade Union is the continuing protection of our trade licensing/ registration systems that have been under constant attack by government legislative changes since their inception. Nothing has been more severe than the attack on the apprentice system that we have today. As a Trade Union we have been at the forefront of training and trade development within the trade and can provide industry-based training to all our members. Most importantly, our Union won the right to vastly improved wages and conditions for our members through enterprise agreements, awards and site agreements. We are a Union that puts our members first. We have quarterly general meetings where members are welcome to attend to voice their opinion. We are proud of this democratic system and encourage all our members to attend. This publication continues this commitment and approach of communicating the benefits of belonging to the Union. Apprentices and the training that leads to the qualification of a tradesperson are constantly under attack from political and employer groups. This Union is committed to protecting and improving the fundamental rights of the Apprentice at work. Becoming a Member of your Union will give you the opportunity to participate actively in the plumbing industry and give you the opportunity to fight for the advancement and improvement of the working conditions that directly affect you. Surveys consistently show better wages and conditions for Union Members. It stands to reason that no individual worker, in particular Apprentices, can stand alone and hope to bargain with an employer on an equal footing. The PPTEU ensures that the members combined stand by our Apprentices and speak with one voice. Due to the high risk nature of our industry, we also give a high priority to training on occupational health and safety issues and special arrangements in relation to the level of competence of the Apprentice skills and knowledge. For a Membership Application Form, you can join online, contact the Union on (03) 9662 3388. Membership rates are based on the time of service in the Trade and are fully tax deductible. An Apprentice is employed under a Common Law Contract binding the Apprentice to the Employer, and the Apprentice has the same rights as any other employee. However both parties are subject to conditions of that contract. The contract of employment doesn’t necessarily lock the Apprentice into a long term contract with the employer and you can end the contract if you need to leave the employer. The training contract must be fully completed and signed by all parties within 14 days of the commencement of the apprenticeship and given to the AAC within 28 days of the commencement of the apprenticeship. This is very important. if you don't have a training contract in place, you will be deemed to be a labourer, and your pay and employment conditions shall apply to that classification. When the training contract is registered, you will receive a letter notifying you that the contract has been registered. This letter will contain information pertaining to the contract such as the registration number, commencement date, nominal completion date, probationary period, qualification details and outlining the parties to the contract. The probationary period is included as part of the total nominal term of the training contract and applies from the start date of the apprenticeship. The training contract is a binding agreement that you and your employer sign detailing the conditions of your employment including the off-the-job training you will get, which is delivered by registered training organisations’ (RTO’s) such as TAFE. The industrial agreement will be either an Award, such as the “Plumbing and Fire Sprinklers Award 2010”, an EBA for plumbing, fire, refrigeration industries negotiated between the Union and your employer, or other. The Training Contract must be fully completed by your employer and you, or if you are under 18 years of age, a parent or guardian. During the probationary period (three months) the training contract can be canceled by either the Apprentice or the employer by giving one weeks’ notice. After this period an Apprenticeship can only be canceled, varied or suspended when the Apprentice and the employer both consent; If you are able to reach a mutual and voluntary agreement to cancel the Training Contract you must both complete and sign the required cancellation form. Contact Victorian Registration and Qualification Authority (VRQA), or your local Australian Apprenticeships Centre for assistance. If you can't reach a mutual agreement to cancel the Training Contract, the Victorian Registration and Qualification Authority (VRQA) has its own procedures. The relevant committee or tribunal will investigate the situation, and either dismiss the complaint or attempt to resolve it. Remember; Once a signature has been sought, that document is a legally binding agreement and is very difficult to appeal. Assistance can also be sought through Australian Apprenticeships, or by contacting the Union Apprentice Liaison Officer, or the agency that co-ordinated your contract. Contact your local Australian Apprenticeships Centre for assistance. Notice of termination and redundancy pay forms part of the National Employment Standards (NES) set under the Fair Work Act 2009. A person employed as an Apprentice is not entitled to payment of redundancy pay at the completion of the training contract, as the Apprentice training contract sets out the period of employment, which is 4 years. However, should an Apprentice continue in the employment of the business (continuous service) then the service as an Apprentice is counted. Because of the special nature of the Apprenticeship employment contract, redundancy entitlements are only available to you after you have completed your Apprenticeship and continue working in the Industry for one year. However, should your Apprenticeship be canceled due to work shortage, or you become bone-fide redundant, then you may claim pro-rata entitlements. The notice period and redundancy entitlement is applicable as stated above. Employers do not pay a contribution, however a levy is applied to every contribution paid into Incolink on behalf of other employees. This levy provides a redundancy entitlement to former Apprentices if they qualify to make a claim. A record of the number of days you have worked on commercial/industrial construction sites is provided to Incolink by your employer each month, called “credits”. The entitlement is calculated according to the number of days and the contribution rate that was applicable during each year of your apprenticeship. It is strongly advised that an Apprentice keep an account of the time spent between different employers and sites (commercial/industrial or domestic), as this may affect your entitlements. Once you have completed your apprenticeship, and are working in industry as a tradesperson, you will be entered onto the system as an employee and your Apprentice details will be credited to your redundancy account. When you have accumulated 52 weeks of contributions, the credit of days will be converted into a dollar amount and will be shown on your ‘Statement of Entitlement’ which you will receive 4 times a year. All redundancy payments are subject to the current rate of taxation. An Incolink severance/redundancy account (default account). An Incolink Genuine redundancy account (GRA). These accounts are treated with different tax considerations, and it is advisable the Apprentice contact Incolink and refer to the severance/redundancy account brochure available on-line. An Apprentice will qualify to claim redundancy payments as described above. To claim, or to make an inquiry, contact Incolink on (03) 9663 3000, or download the appropriate form. Whilst your employer is providing Incolink with your employment status (called credits), Incolink will cover you with Leisure Time Insurance and also provide you and your family with Emergency Transport Cover and Dental Accident Insurance. Income Protection and Trauma Insurance (IPT) is payable under the EBA and entitles you to Leisure Time Illness Insurance, TAC and WorkCover top-up and other insurances. Contributions are shown on your Incolink statement. Portable Sick Leave (PSL) is also payable under your EBA, and enables you to access a maximum of 100 days sick leave you would normally lose when you leave or are terminated by your employer. CoINVEST is the trading name for CoINVEST Limited which is responsible for administrating the Construction Industry Portable Long Service Leave Scheme throughout Victoria. As an Apprentice in the construction industry, regardless of the industrial agreement you are under, you should be registered with CoINVEST so you can receive long service leave entitlements – at no cost to you. The term 'portable' means service is accrued by multiple employers as you work throughout the Industry, and it is advisable you keep employment records such as Taxation Group Certificates for proof of service, as this will provide evidence of time served to assist in any disputed claim. All time spent with your employer counts as service, including annual leave, sick leave, WorkCover, RDO’s, public holidays and time spent at TAFE. Conditions apply; however, after 7 years of continuous service credited with CoINVEST, a pro-rata claim can be made. Check with your employer to make sure you are registered or you can check your own details on the CoINVEST web site at www.coinvest.com.au. By setting up your own 24/7 online access. Established in 1984, Cbus is an Industry superannuation fund that originated in the building, construction and allied industries. Cbus is managed solely for the benefits of its Members, and all profits belong to its Members. Cbus pays no commission to sales agents, and no shareholder dividends. Cbus provides 24 hr insurance cover for death and permanent disablement (TPD), (subject to eligibility criteria) and many other benefits such as banking services through Members Equity, financial planning and many more products. Apprentices need to be aware when they initially become a member of Cbus, they generally nominate to have 2 units of insurance up to the age of 21yrs. It is the members responsibility to ensure the amount of insurance cover ie, death or TPD, meets the members needs as their life changes, ie, mortgage and family commitments. Units of cover are nominated by the member, and the number of units dictate the amount of insurance payable should a claimable event occur. All Apprentices must currently receive employer contributions at a minimum rate of 9.5% of their wage. The percentage will increase to 12% over a period of time, depending on federal government legislation. Co-Contribution: If you are a low or middle income earner, you can make a personal super co-contribution payment each financial year and be eligible for a Federal Government payment into your superannuation account. The government will add up to 50 cents for every (after tax) dollar up to a maximum of $500.00. This is when you and your employer make a valid agreement to pay some of your before tax wages into your super account. There are many advantages, such as reducing your assessable income, contributions taxed at a lower rate in the fund, and the long term advantage of increasing the earnings at retirement. Financial advice is strongly recommended prior to entering into an agreement. Extra contributions your employer makes for you under a salary sacrifice arrangement are “reportable employer super contributions”, and must be shown on your pay slip advice. Any Apprentice with queries about Cbus membership or their contributions should contact Cbus on 1300 361 784. You can also set up your personal 24/7 online access here. How do I know if I am covered by an EBA or non-EBA agreement? When an Apprentice signs their Contract with their employer, the industrial agreement under which the Apprentice is employed is contained within that agreement. This will state if you are covered by an enterprise agreement known as an EBA, which is an agreement between your employer and the PPTEU made on your behalf as a member of the Union. Another type of agreement is the Plumbing and Fire Sprinklers Award 2010, which is a non EBA agreement, which sets out differing sets of pay rates and conditions. Some Apprentices move between these agreements, such as those who change employers, and it can become confusing for an Apprentice working between the two agreements. It is strongly recommended all Apprentices keep a record of their work history, as entitlements such as redundancy, site allowances, RDO’s etc, will be affected depending on where the Apprentice spent their time. Any Apprentice who is unsure of their employment contract, conditions of pay, or general working rights within their workplace are encouraged to contact the Union Apprentice Liaison Officer. An employer needs the Apprentice to stay at work due to staffing levels. Illness (This can be physical or psycho -social). Breakdown in communication between employer, school, yourself. Non attendance can be an issue for dismissal of Apprentices. Being behind in schooling may also affect your re-employment with a perspective employer should your current employer terminate your contract through insolvency or any other unforeseen circumstance. Keeping on track is important. If for any reason an Apprentice finds they are experiencing difficulty in making up lost time, whether it is due to circumstances within their control or not, and discussions with your employer are unsatisfactory, the Apprentice is advised to contact the Union Apprentice Liaison Officer at the Union office on (03) 9662 3388 as soon as they become aware the situation is causing their concern. All Apprentices are covered by an Industrial Agreement, whether it be an EBA or Award. Apprentices presenting reports of satisfactory progress will be reimbursed all fees paid by them in respect of their apprentice training. It is the goal of appropriate and timely training of the Apprentice to provide for varying scope of supervision from direct to broad supervision over the four year cycle of the Apprenticeship. It is not to be assumed the longer the Apprentice is in trade, supervision diminishes automatically, as new skills and types of work are encountered at any level of training. Direct supervision can be defined where an Apprentice requires a tradesperson to constantly review the standard and work practices to ensure the quality and safety of the Apprentice. The tradesperson shall be in the immediate area of the Apprentice at all times. General supervision can be defined where an Apprentice does not require constant supervision, but requires a tradesperson to make face to face contact with the Apprentice on a daily regular basis to ensure the quality and safety of the Apprentice is being maintained. Regardless of the time spent in trade, an Apprentice must never work in a situation where they are unsure or uncertain of what is required or how the task is to be performed safely. All employees, and more-so Apprentices, must be fully trained, informed, instructed and supervised by the employer. It is a legal obligation of the employer to ensure the safety of their employees. The “Occupational Health and Safety Act 2004” places a duty of care on employers to provide such supervision to employees as is necessary to enable the employees to perform their work in a manner that is safe and without risks to health. The above guidelines do not remove or reduce the employers duty under the ‘Act’. Laws covering injured workers are extensive and complex. The Union has an OH&S Unit to provide advice to Members who simply need assistance with their claims or issues that arise on a day to day basis. Legal representation for our Members who are in dispute with employers and insurance agents in regards to their claims is also available. As an Apprentice and a Member of the Union these services are available to you, and it is recommended that an Apprentice who is injured at work or elsewhere, ie traveling to and from work or even out of work hours, contact the OH&S Unit if you are uncertain of your entitlements or have concerns about the way your injury is being treated and managed. The apprenticeship support program provides support to young apprentices during their fist year of training with 28 apprenticeship support officers providing services to apprentices across Victoria. The apprenticeship support program assists appprentices to contact other services such as Centrelink, the FairWork Ombudsman and WorkSafe. They can also assist apprentices to access literacy and numeracy support, drug and alcohol counselling or mental health practitioners. For more information, visit www.education.vic.au/training/learners/apprentices. 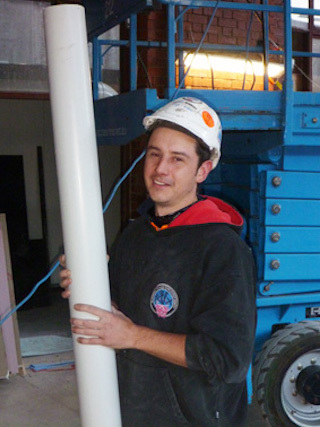 To continue to carry out plumbing work in Victoria when your plumbing Apprenticeship is complete, it is a requirement to become registered or licensed with the Victorian Building Authority. Successful completion of the Victorian Building Authority Assessment (journeyman’s exam) for the classes of plumbing you wish to become registered in, usually completed at the end of your trade training. What can a registered plumber do? A Registered plumber can perform work in all classes of work he/she is registered in, but must do so under the supervision of a licensed person. The work of a registered person must be certified by a licensed person. What can a Licensed plumber do? In addition to be eligible for registration in classes of plumbing a registered person may elect to undertake the Victorian Building Authority license assessment to become licensed in that class. Licensed people in a particular class of plumbing may undertake all relevant work, certify the work themselves and supervise/ certify the work of all other registered persons in that class. Further information on all aspects of registration and licensing including application forms and requirements can be obtained from the Victorian Building Authority website at www.vba.vic.gov.au or by ringing 1300 815 127. Training doesn't finish with trade school. The Plumbing Trade is at the forefront of facing the challenges of reducing greenhouse gases and saving water and energy for the Victorian Community. The Union had the fore-sight of meeting these challenges, and developed a six star training facility that does not exist anywhere else in the world. The Plumbing Industry Climate Action Centre is a world's best practice facility and offers training for Union Members in all aspects of training and sustainability required of the Plumbing Industry. The Centre offers training in all areas of up-skilling required of tradespersons from traffic management, confined space, boom and scissor lift, fork lift, roof safety and other OH+S modules. The Centre also focuses on ecological, economic and Industry sustainability, training in areas such as new technologies and innovation, sustainable products and practices for the up-skilling of new and current Plumbers dealing with the current climate change environment. Such training will encourage Plumbers to remain within the Industry by offering the flexibility of being able to train for a variety of roles, and expanding the employment opportunities of those that have taken up the training. All training is FREE to Union Members, and fees are subsidised to your immediate family. Understanding your Insurances as an Apprentice. Insurance cover under your EBA entitles each Apprentice extensive cover whether you are injured or become ill at work; or out of work hours; and in the case of emergency ambulance and accidental dental cover, your immediate family also. Whilst your employer is providing Incolink with your employment status in the commercial/industrial sector (shown as "days worked" on your statement), Incolink will cover you with Personal Leisure Time Injury Insurance and also provide you, your spouse and dependent children with Emergency Transport Cover and Dental Accident Insurance. (Service in the domestic sector excludes the Apprentice from these insurances). Also : Read the Bulletin "Incolink Insurances explained: How to make a claim"
You may need to fill out two claim forms on separate insurers to receive your full benefit, depending on where your employer pays IPT on your behalf. This section is intended to provide a general summary. It is not intended to contain all the information that may be relevant to a particular matter. The Insurances are extensive and conditions apply. IPT is payable under the EBA and entitles you to Leisure Time Illness Insurance for a maximum period of 156 weeks or such lesser period whilst a worker is unable to return to work as a result of the illness, TAC for a maximum period of 104 weeks, and WorkCover top-up for a maximum period of 78 weeks, and other insurances. Contributions are shown on your Incolink statement. PSL is also payable under your EBA, and enables you to access a maximum of 100 days sick leave you would normally lose when you leave or are terminated by your employer. All Apprentices should contact Incolink and set up their own 24/7 online access to check currency of contributions. If you work in the commercial/industrial building industry, and your employer provides Incolink with the days you work on these sites, or is paying Incolink Redundancy contributions, you will receive Free Personal Accident Leisure Time Insurance Cover. Benefits include a weekly benefit payment for up to 156 weeks for an accident/injury which occurs outside of working hours and prevents you from working. Additional benefits include Capital benefits, Broken Bones benefit and a Funeral benefit. Cover is also extended to your dependents for a Dental Accident only occurring outside working hours. Emergency Transport for ambulance usage is covered anywhere in Australia (where not work related and not covered by any statutory transport accident scheme). This insurance will apply whilst apprentice days and/or redundancy contributions continue and remain current (conditions and exclusions apply). If payments are not up to date, cover will not be available when needed. If a Member finds the premiums are not up to date, ask your employer why or contact your Union. NEVER SUBMIT A CLAIM BEFORE ENSURING PAYMENTS ARE UP TO DATE. When you receive workers compensation from a work related injury or illness, WorkCover will only reimburse the injured worker 95%/80% of the pre- injury earnings at the ordinary rate of pay. During the first year (52 weeks) the employer is required to make up the remaining 5%/20%. However, from the 53rd week to a further 78 weeks the 20% is paid by the insurance cover. It is the injured workers responsibility to initiate the claim. registered as seeking work through Incolink, Centrelink or the Union or equivalent. Sick leave is not required to be used. Provides cover (156 weeks) to an Apprentice who become ill in their leisure time, and which prevents the worker from working. Other examples are brain tumor, stroke cancer/leukemia. A 14 day waiting period applies, and the worker must use all available sick leave/portable sick leave first. Entitlement to claim ceases immediately on the day a worker ceases employment with the contributing employer. Provides cover where an Apprentice suffers injury whilst traveling to and from work and receives an entitlement from the TAC. The cover makes up the difference between what the TAC pay (80% of ordinary earnings) and 100% of ordinary earnings (combined total $1,500) to maximum of 104 weeks. Provides cover to an Apprentice who suffers a workplace injury, resulting in death or permanent total disablement which is not an illness and is covered by a statutory workers compensation scheme. The weekly benefit is only available when you suffer an injury whilst in direct travel to and from work, which prevents you from working, and does not give rise to to any entitlement to TAC or WorkCover. Members are advised to check that their contributions are kept up to date by their employer, and to contact the Union should they have any inquiries when making a claim. REMEMBER, NO EMPLOYER CONTRIBUTIONS - NO COVER. Apprentices may be eligible for a loan to help them cover the costs of living and learning. The loans are interest free but indexed annually with the consumer price index. To read more on the loans available through Australian Apprenticeships , click here. If you’re eligible for the trade apprentice discount you can get 50% off your 12-month car registration and Transport Accident Charge renewal fee. make sure your employer is supportive of your application. Even if you’re approved, if your employer can’t verify your using your car for work purposes, you’ll be sent an invoice for the amount you need to make up. Young workers between the ages of 15 to 24 are more likely to be injured and hospitalised than any other age group. The Union and WorkSafe Victoria have developed this easy reference fact sheet to provide you with the information you need to stay safe at work, so you can come home safely, every day. Who can you speak to for more information or help? You could speak to your employer, immediate supervisor and/or health and safety representative (HSR) if your workplace has one. HSR’s are there to speak up on behalf of the workers they represent on health and safety issues when dealing with your employer or management representative. If your workplace doesn’t have a HSR, anyone can ask your employer to set up a process so one can be elected. You could also speak to anyone else you trust-a family member, trade teacher, workmates etc, or your Union Apprentice Liaison Officer. So Who is Responsible for Workplace Health and Safety? Your employer must make sure that your conditions of work are safe and healthy, regardless of the type and terms of your employment. This includes protecting you from both physical and psychological workplace hazards such as slippery floors, lifting heavy loads, faulty machinery, bullying, violence, fatigue and work-related stress. Show you how to do your job safely and how to recognise and report hazards on the job. Provide and show you how to use the necessary equipment, and how to safely wear any protective gear such as gloves, safety footwear and goggles. Help you get to know the layout of the workplace, your immediate supervisor, health and safety rep and workmates. Asking for your input when looking at any workplace hazards and ways to control those hazards. Discussing new equipment when it is introduced into your workplace. Discussions at team or toolbox meetings. Discussions with your health and safety representative. You must look after yourself by working safely, following workplace procedures and not putting your workmates at risk. Know and follow all the health and safety requirements that affect your job. If you don’t know how to do something safely; or aren’t sure, ask for help or training before you begin the task. Work is important, but your life is more important. If you are concerned about your own or your workmates health and safety, talk to your employer, immediate supervisor and/or health and safety representative straight away. This might be about faulty equipment, slippery floors, lack of protective gear or bullying and violence at work. It is an offence under the “Occupational Health and Safety Act 2004” for an employer to threaten, discriminate, dismiss or alter the employment to the detriment of an employee for raising concerns about health and safety in the workplace. If you need more help or information, you can anonymously call WorkSafe Victoria on 1800 136 089 (toll free), or the Union OH&S Unit (03) 9662 3388. Incolink’s Apprentice Support Workers team offer a free confidential support and referral service to Apprentices to ensure they are equipped to deal with workplace, trade school and personal pressures and difficulties. This includes information on issues like drug and alcohol abuse and suicide prevention. The workers are also available to provide follow-up support and counselling to apprentices. The 24/7 counselling and support service can be contacted on 1300 000 129 anytime.